What is an image board? An image board is a place where people can post images of whatever they like, within reason. There are different categories that we have made available for the different interests we have. Once we get more resources at our disposal, more boards will be added over time. Familiarize yourself with the rules before you start posting. If you start posting without observing the community first, you will sound rude, immature, and uninformed; these posts are usually ignored. It's okay to voice your opinion, but disrespecting others is a good way to get flamed. When posting, use proper English. Poorly written posts with bad grammar and spelling will be ignored, openly ridiculed, and probably deleted. How do I set a username? 7chan does not have a registration system. Most users post anonymously. If you want to verify your identity, use a tripcode. What is a tripcode and how do I use one? A tripcode is something a user can put into the "Name" field when posting on an image board to uniquely identify themselves. This prevents another user from "stealing" another's identity. Basically whatever password you enter is encrypted, creating a hash value that is displayed, uniquely identifying a user. This method is not fail-proof, but it is something a user has the option to do. Tripcodes can be used by putting a # (hash sign) after one's name in the "Name" field and your own password. Typing "john#password" into the Name field would result in john!ozOtJW9BFA being displayed on the board. What is a secure tripcode and how do I use one? A secure tripcode is unique to the web site you use it on. While a normal tripcode will be the same for every other image board, the output of a secure tripcode will be unique to 7chan. Secure tripcodes can be used by putting two ## (hash sign) after one's name in the Name field. Typing john##password into the Name field would result in john! !R0LGD2LmN0 being displayed on the board. Additionally, you can combine a regular tripcode and a secure tripcode when posting. What are these sage and age things I keep hearing about? "Sage" comes from the Japanese verb sageru (下げる) which means "to lower", while "age" comes from the Japanese verb ageru (上げる) which means "to raise". Using sage allows a user to reply to a topic without bumping it to the top. A user would sage a topic when he or she doesn't like what was posted, so it then adds to the amount of posts the topic has, allowing it to be pruned from the board more quickly without bumping the topic back to the first page of the board. To sage a thread, simply enter "sage" in the email field. Although age is sometimes used, keep in mind that it is not needed in order to bump a thread. How do I quote another post? Simply click the post number of who you wish to quote, and put a ">" before the text you wish to quote. Can I delete my own posts? Yes. Check the box near your post, scroll down to the bottom of the page, then click delete. You can delete the file only if you want, just check the "file only" radio button. Please note that it is necessary to set a password in the password field when making a post in order to be allowed to delete a post. How do I make text bold, italic, underline, etc.? You can combine tags as well. I didn't delete my post, where did it go? As each of our respective boards have a 10 page limit, threads "fall off" of the boards when they are pushed to the very back. Additionally, a staff member may have deleted it if it was against the rules. Why can't I bump a thread to the top of the board? Threads enter "auto-sage" upon reaching a certain number of replies. Once this threshold is reached, said thread will stop bumping. This prevents threads from staying on boards for too long, and becoming stale. How can I post a whole directory of images? You can use xChan Directory Dumper. Use the settings below to properly dump your directory. Remember to make your topic first. 6. Choose your post message if you want one, DO NOT use statistics mode. 9. Click "Dump your load"
What can I do to be a part of the community? There are many ways to contribute. When you are ready, you should start posting. Commenting in threads, helping with requests, and joining the IRC channel are great ways to join in the community. How do I become part of the staff? Unfortunately we do not accept applications; the best answer is to not ask. Administrators will decide when a user is fit to become part of the staff. 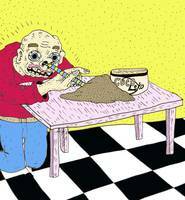 They are similar to fads, but more like internet phenomena. In order to understand them, you will need to figure out over time. They are a key part of 7chan's culture; please take the time to understand them. Demonstrating a lack of knowledge in our culture will often be met with hostility. I don't understand these phrases and I was told to "lurk moar". What does that mean? It means that you haven't been around long enough to understand the community, and that you've shown a general lack of knowledge in our culture. 7chan's community has its own culture and morals, and it is best to stick around and slowly understand what everything means before posting or asking a question. Why is posting "Furry" artwork outside of /fur/ a bannable offense? Due to previous issues with furry artwork, posting any content that has furry artwork in it is prohibited outside of /fur/. 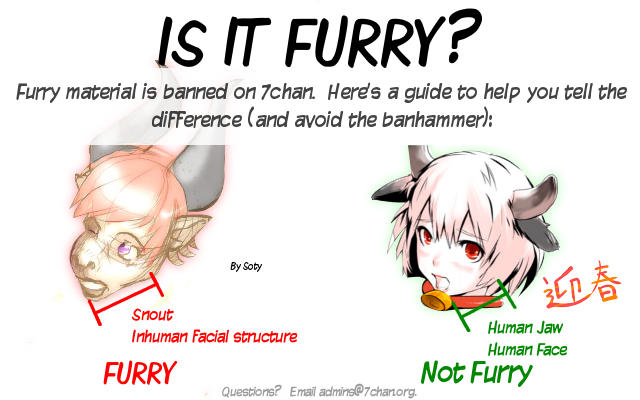 Furry artwork has historically been a thorn in 7chan's side. After having an entire board for furries to post in, the administrative staff decided that there were far more drawbacks to furry artwork than benefits, and after a slew of DMCAs and drama, the furry board was closed and furry artwork was banned. However, we've recently re-opened the board with a set of dedicated moderators and administrators, and have streamlined our DMCA processing pipeline. How do you define furry artwork? What is the IRC channel for? The 7chan IRC channel is a chat room for 7chan users. The staff can be found here usually conversing with the users, so please join us for a chat. Click here to connect to the channel if you already have a client installed. Go to http://www.silverex.org/download/ and download and install Xchat. Running X-chat for the first time you will see the Network List window. First start by filling in your user information. Your nick name is is unique to you. Only one user can use the same nick name at one time. (If you would like to register your nickname so nobody else can use it, click here after you have connected to IRC) Your second and third choice are in case someone else has the same nick name and is connected to the server. Your user name and real name can be anything you'd like. 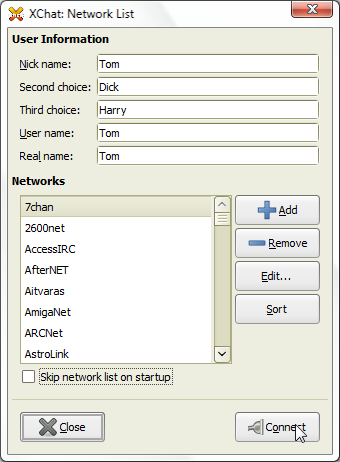 Once you have finished your user information, click Add and name the new network 7chan. Once your network is named, click the Edit button. A new dialog window will open up, click edit. Rename newserver/6667 to irc.7chan.org/6667 just like in the picture. If you would prefer to automatically join 7chan's IRC channel, type #7chan to the favorite channel list. Finally, change your character set to UTF-8 (Unicode) in the drop down box. If you can connect through SSL, change newserver/6667 to irc.7chan.org/+6697 and check off the box labled Accept invalid SSL certificate. You're finished! Click connect and you will join the 7chan IRC channel. If your firewall asks for permission, allow XChat to pass. How do I keep my nick name? What is Nickserv? Why am I being asked to change my nickname? Where can I learn more about IRC? I'm banned, what should I do? You should first find out why you were banned. If you truly deserved it, you should wait for it to expire (note that some bans are permanent). If you believe that the ban is for someone else, or it was an unfair amount of time, please state this in the appeal form. You can also speak with the staff on the IRC channel. Do not try and evade the ban, your IP range will be banned and your ISP may be notified if the situation permits it. I can't view 7chan, is there something wrong? It's possible that the server is down for maintenance. Check with the IRC channel, or try again later. I was banned for using a proxy, what gives? 7chan does not permit the use of proxies. While they do have their advantages, they can be used to bypass bans. Please disable your proxy to start using 7chan. If you believe there was a mistake, please speak with the staff on the IRC channel. I can't post a picture; the error message says that there is a duplicate entry, what do I do? In order to reduce flooding, only one copy of an image may be posted at a time. If the image was posted by another poster, you may still get the error message. I have a complaint about a poster or a thread, who do I go to? There is a report button on the bottom of every board page. Simply check the box near the reply you wish report, scroll down to the report button on the bottom of each page, and follow the instructions. If you have a complaint, please visit our IRC channel and contact a staff member. How does 7chan protect me? 7chan practices a transparent nonlogging policy. We keep absolutely no Apache access logs to guard your IP addresses in the occurrence of federal seizure of our server(s). I have a question, but it's not listed here, what do I do? Please speak with the staff on IRC.